View of Castle Street in Liverpool from the end of the High Street. Castle Street is one of the original streets of old Liverpool. In this picture, to the left there is a bank, to the right is the side of the town hall, built in 1749-54 by John Wood of Bath. 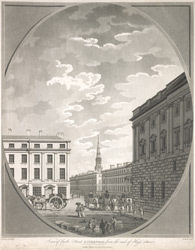 In the distance is the spire of St George's Church, which was consecrated in 1734. This was built on the site of the old castle of Liverpool, which was demolished by the town authorities some time between 1718-1726. The church was designed by Thomas Steers, engineer of the first dock.